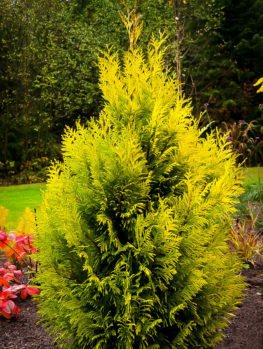 The Arborvitae are a group of evergreen trees that are extremely hardy and very useful as specimen trees and especially for making evergreen hedges. 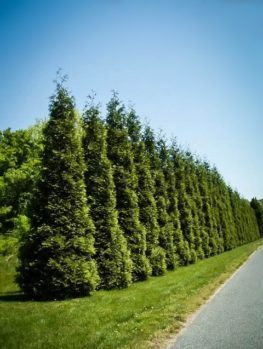 They are very fast growing and will quickly produce a dense hedge that will give complete all-year-round privacy. 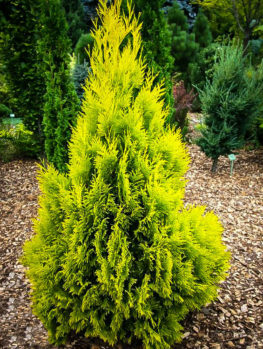 They are conifers (needle-trees), but unlike other conifers like pines or junipers the needles are short, soft and cling to the stems, so these trees are soft to the touch, making them comfortable to work with when clipping them. 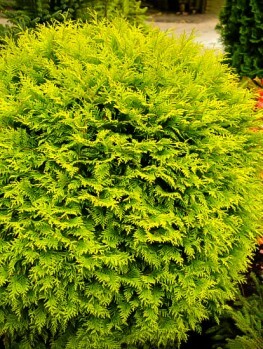 They are notable for the rich green color of the foliage which creates a very attractive backdrop to the garden. Over time some will grow into large trees but in gardens they are usually kept clipped to a suitable height. Screening is a vital need in many gardens. Few of us want to be enjoying our gardens while being looked at by our neighbors, or passing cars. As well, many of us have views that are not very attractive or even downright ugly – and a screen is often the best way to eliminate unattractive views, gain privacy and also cut down on wind and snow and make the garden warmer. Living plants do a far better job of this than wooden fences, since plants are very effective noise barriers and slow down the wind extremely well. Besides, looking at a wall of living green is much better than seeing a hard fence. Sometimes you may already have a fence and a hedge planted along it will make it so much more attractive in just a short time. There are many plants that can be used for hedges, but evergreens are the usual choice because we normally want screening all year, not just in summer – indeed, wind protection is often more important in winter and a hedge without leaves doesn’t block very much wind. Fast growth is obviously important as you want to see your hedge mature as soon as possible and it is here that these plants really prove their value. 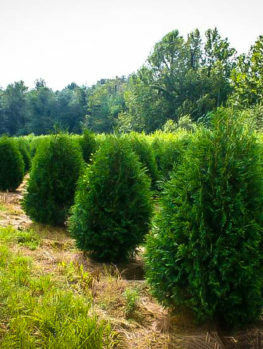 The Thuja ‘Green Giant’ will easily grow 3 feet a year when young and the Thuja ‘Emerald Green’ will grow at least 2 feet a year, so both of these trees will produce a 10 or 12 foot hedge in a very short time. 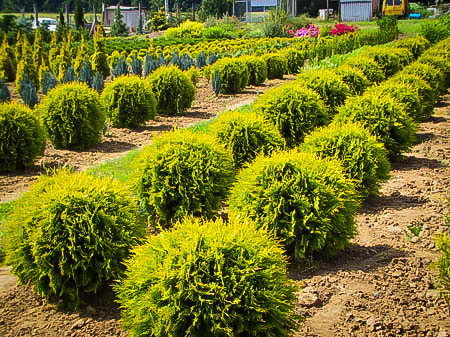 So when selecting plants to make a hedge Arborvitaes are right at the top of the short-list. Their warm, bright-green color is especially attractive throughout the year and shows your garden plants and features at their best. 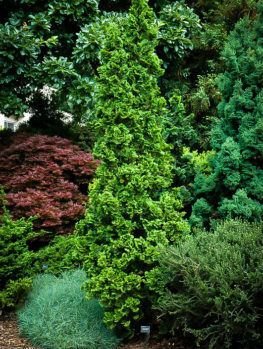 Arborvitae or Thuja also make attractive garden specimens and accents since they bring a strong upright form to the garden and contrast with most other plants, which are more rounded. These accents can be planted alone, in groups of three or five or spaced out in pairs along a drive or walkway. Sometimes something upright is also useful to frame an entrance or stairs and since these trees can also be clipped, they can be kept as narrow exclamation points for many years. For hotter regions Italian Cypress is a better choice for this purpose. These trees have a strong central trunk and a narrow form. If exposed to sun the lower branches will remain for many years, making it easy to keep a hedge green right to the ground. The branches are clothed in thin green stems with the leaves attached flat to the stems and open out from the branches in sprays. The bark is light-brown and stringy, but is rarely seen except in very old trees, so densely do the branches grow. There are no flowers but small cones may sometimes be produced on un-clipped plants. These are only ½ an inch long and cluster towards the ends of the stems. 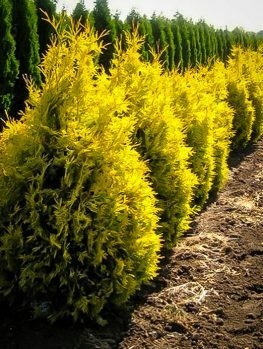 The foliage is bright green in color, paler in the new growth but never going dull and dark like hemlock or yew trees do, so a hedge of Arborvitae is bright all year round. 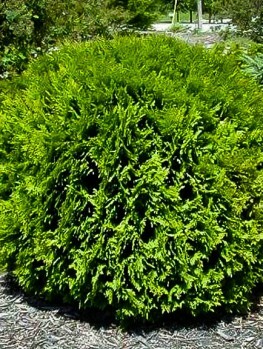 Emerald Green Arborvitae Thuja occidentalis ‘Emerald Green’ 8-12 ft. 3-4 ft. You need an dense, uniform screen for your landscape. 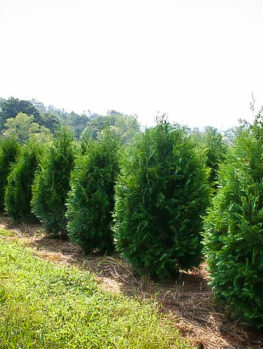 Techny Arborvitae Thuja occidentalis ‘Techny’ 10-15 ft. 6-10 ft. You need a larger, darker green dense screen. 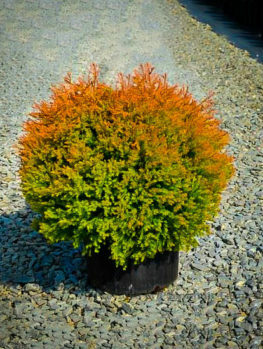 Globe Arborvitae Thuja occidentalis ‘Danica’ 12-24 in. 12-24 in. 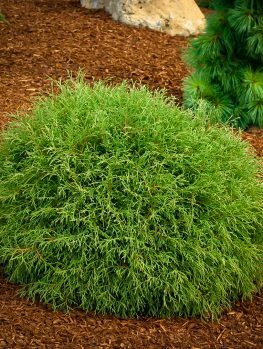 Your landscape needs small, dense & round evergreens. 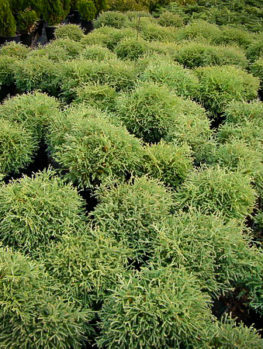 Thujas come from cooler regions, so many, such as Thuja ‘Emerald Green’ are hardy all the way into zone 2, where temperatures go below -40o. They grow best where it is not too hot in summer, or too dry. 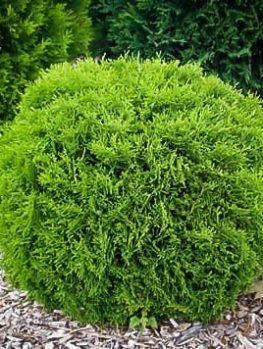 For warmer areas Thuja ‘Green Giant’ is a good choice and will grow right into zones 8 and 9 if you are in wetter parts of those zones, or have irrigation. These trees need moisture to thrive, grow fast and become good hedges, but provided it is not also too hot, established plants will be resistant to moderate drought conditions. 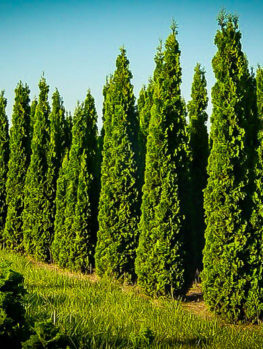 Arborvitae will also take partial shade, a great asset in a hedge plant. They are not particular about soil and will grow in almost all soil types but in poor soils they made need hedge fertilizer to achieve their best growth. For a shorter hedge (less than 8 feet tall) plant 3 feet apart. For a larger hedge or screen, plant 4 to 6 feet apart in a single row, or for a thicker screen in a double row 8 to 10 feet apart, staggered, with the rows around 4 feet apart. 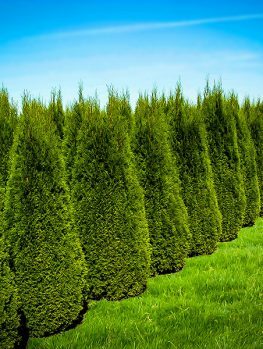 If you live in a suitable zone, and need a very tall hedge, choose Thuja ‘Green Giant’, which can easily grow to 20 or 30 feet tall. Dig a trench for the row and space the plants evenly along the trench. Put back most of the soil and firm down well. Add lots of water and when it has drained away put back the rest of the soil. Use the same method for individual trees, but dig a hole two or three times as wide as the pot, but no deeper. 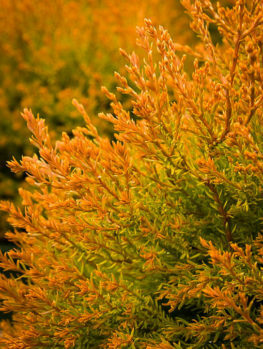 Water your Arborvitae tree every week during the first season or two, but once established water is only needed during dry spells. When watering during dry weather give lots of water once a week, rather than a sprinkle every day. Trickle hoses are good ways to water Arborvitae hedges if you don’t have a full irrigation system installed. For good strong growth during the earlier years apply a slow-release hedge fertilizer in spring and make sure the soil doesn’t become completely dry. 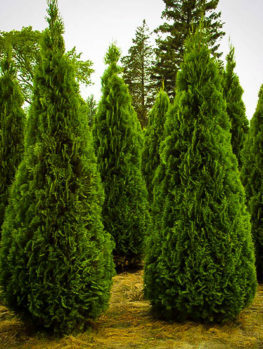 These trees are a group of evergreen conifers called Thuja, found growing right across North America and also in parts of China, Japan and Korea. Natural forms grow into tall trees which in areas like the Pacific Northwest form a major part of the natural forest. Western Redcedar (Thuja plicata) is an important Arborvitae which is widely used for its timber, which is resistant to decay and therefore excellent for roof shingles, boat building and garden structures as it needs no preservatives or paint. This tree can grow very tall and trees over 200 feet tall are known. 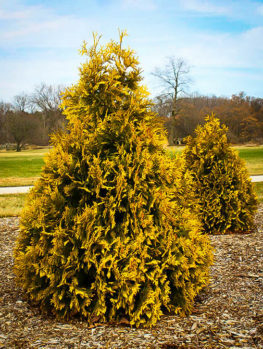 The much smaller White Cedar, or Eastern Arborvitae (Thuja occidentalis) is found all around the Great Lakes on both sides of the border where it grows in wetlands and damp areas. 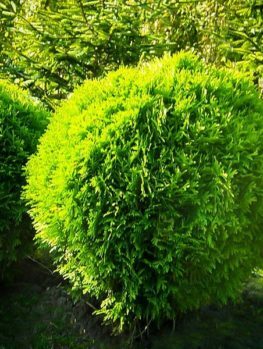 The Asian species include the Japanese Thuja (Thuja standishi) which is a parent of that amazing hedge plant Thuja ‘Green Giant’. 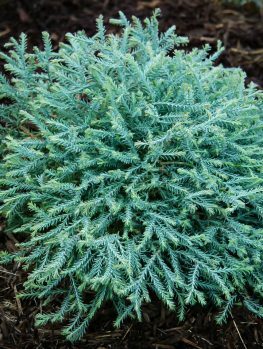 It is called Arborvitae because a tea made from the leaves is rich in vitamin C. The Native Americans taught the early settlers to drink a tea made from White Cedar to avoid scurvy, which it did so well they called it the Tree of Life, which in Latin is arbor vitae. Today there are safer sources of vitamin C, since some parts of the Thuja can be poisonous and this tea must be carefully and correctly made. 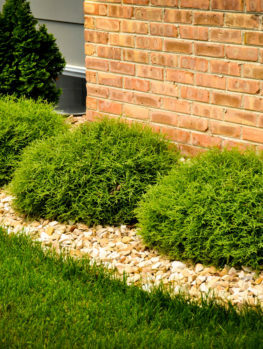 An established Arborvitae hedge will only need fertilizer if you notice that it is looking a little thin or if the spring growth is weak. Use a slow-release hedge fertilizer and apply it in early spring. Your hedge can be trimmed at any time, but early fall is best, and if needed again during early summer to reduce the possibility of stress from clipping during the hottest days. Remember that the more you clip, the denser your hedge will grow. Start clipping when the hedge is young – don’t wait till it reaches its final size and don’t cut so hard that you leave bare branches, since these will not grow back leaves. When making a hedge, always keep the top narrower than the bottom, so that the sun can reach right down and keep your trees green and lush right to the ground. Never let the top get wider than the bottom. If you live in an area with heavy snow it is best to keep the top rounded, rather than square, as this will shed the snow better and reduce to zero the risk of breakage. Use a good pair of shears and keep them sharp so you don’t leave ragged edges that may turn brown. The Perfect Fast Growing Tree For Your Property! 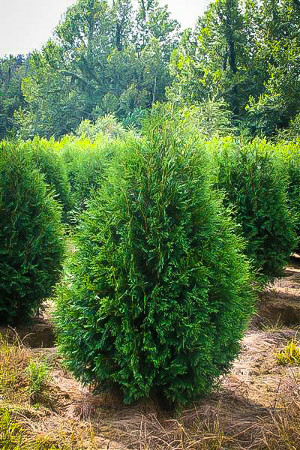 Arborvitae Trees are among the fastest growing hedge plants available and are an excellent disease and pest-free choice for screening and also as attractive trees for specimens where vertical accents are needed. 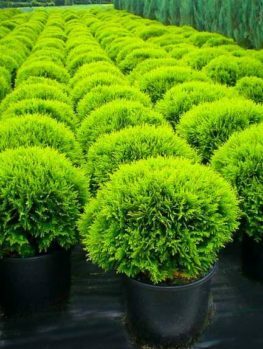 Their attractive bright-green color is a perfect backdrop to any garden and they will bring quality and character to your property.